Lots of people pray when there's a natural disaster. I don't understand that. Don't get me wrong, I understand the wanting to be saved. But you what are you doing? 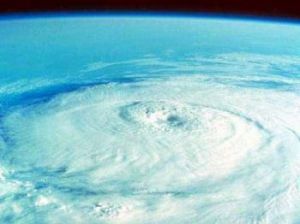 It's pretty obvious what side God's on: he sent a giant hurricane! I'm thinking...if a guy tries to hurricane you...he's probably not a big fan of you. Meanwhile everyone's like: "Know who could get me out of this mess of God sending a giant hurricane on me?...God! I should tell him how great he is!" That'd be like if General Motors closed down a big factory and the whole town went out and bought them gift baskets saying they were awesome in hopes that they'd magically reverse their decision. That's why when something bad happens I suggest not praying at all...but maybe we should start a union.